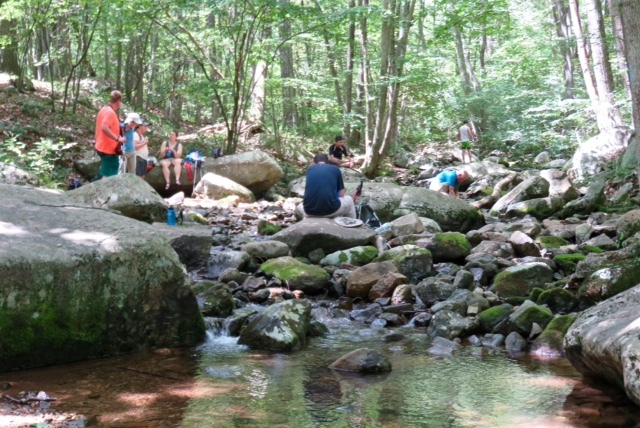 Southern Shenandoah Valley and Charlottesville chapter enjoyed a wonderful weekend of camping and hiking at Spruce Knob Recreation Area. 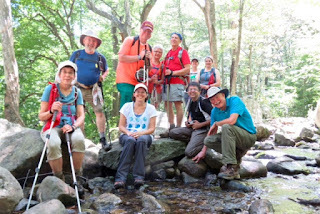 Ten hikers, including Pete and Bev Fink, Marit Anderson David Crowe, Susanna Williams, Jeanne Siler, Iva Gillette and C J Woodburn hiked out and back, eleven miles to the beautiful Seneca Creek Falls. Hike leaders Mike Smith of SSV Chapter and Barbara Martin of the Charlottesville Chapter co-led the hike. We were blessed with great weather. We stopped along the way to see Judy Springs. Mike Smith was a wealth of information about butterflies, plants and birds. We had lunch at the gorgeous Seneca Creek Falls. Ten hikers joined hike leader, Gabriel Garretson on a very warm August day to hike up the Lower Nicholson Hollow Trail from the Old Rag parking lot to Corbin Cabin. Other hikers included Anne Colgate, Art Bykonen, Bev and Pete Fink, CJ Woodburn, Claire Cline, Gopal Midhe, Iva Gillet, Maynard Davis, and Patrick Cory. The overall hike was ten miles long with 14oo feet of ascent. 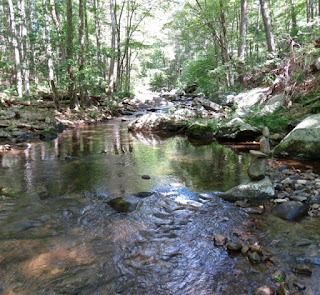 Most of the hike was along the beautiful Hughes River and included eight major stream crossings. 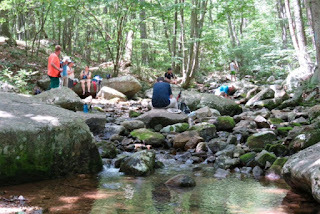 Due to the heat we hiked at a slower pace with frequent stops to cool with river water. 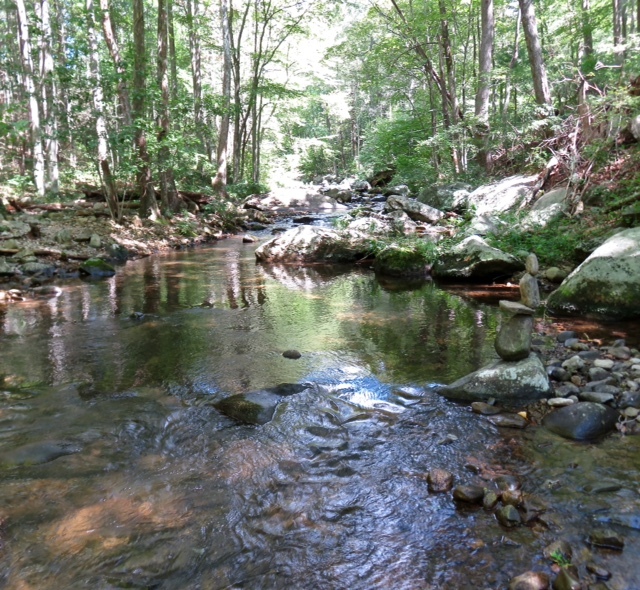 The hike also included a visit inside historic Corbin Cabin and a swim in the Hughes River on the return. Despite the heat, everyone enjoyed the hike and several requested a repeat hike in cooler weather this fall. Claire Cline did an excellent job as our hike photographer. 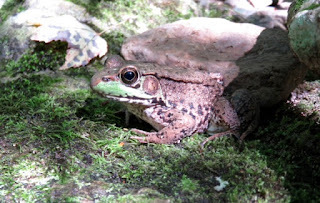 Dan Ralston and Gabriel Garretson led nine very courageous hikers on a hike described by one of the group as: “Hikes that are defined by the weather are the most talked about later for years to come. 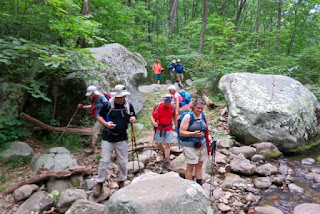 This will be one of them for me!” Those on the hike included Jeanne Densmore Ralston, Kelly O’Rourke, Charles Staples, Brad Young, Pete Fink, David Crowe, Claire Cline, Patrick Cory and Keith Cain. This hike included it all. Perfect sunny weather, beautiful vistas and green views of new growth in a forest of burned trees, multiple stream crossings, then lightening and pouring rain and a couple of zillion people eating bugs that were resistant to Off and to Deet. All eleven of us will not soon forget this ‘memorable’ 10 mile hike through the burned forest. cookies to help us retrace our steps. A month earlier, I cleared grassy growth north of Rockfish Gap so it was time to clip the small branches that grow into the trail corridor. James McAdams joined me. As we started, I noticed that numerous water run offs that Tony Alimenti and I cleared and improved in spring looked good, with little debris buildup, so perhaps we are getting close to self cleaning drains. Along the trail, there was less growth than I expected. We found since the last trip that a rotted tree fell across the trail. With gloved hands, we pulled away most of the tree in the trail section. 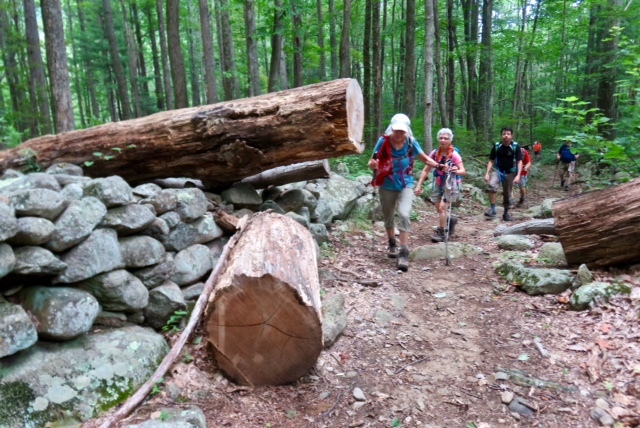 We reached the spot where last month's clearing ended, and a large tree had fallen over the trail. Much of it had rotted away but because it was a large tree, there was still considerable hard wood, in a shell small enough for our saws. We rolled the cut section of the tree to the side of the trail to make a seat, and discourage people from using a detour around the tree. We walked a little further north, and as expected the trail was not overgrown. On our way out, we decided to cut another blowdown which our saws were just large enough to cut. After we cut it through, James was able to move the tree off the trail. By now, the forecast hot conditions had arrived so we were glad we had completed a successful day. We saw fewer people than on earlier trips on this section. 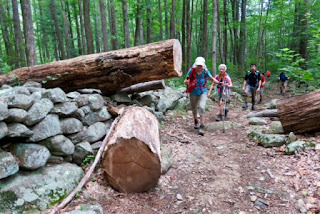 Hot weather deterred us from doing any clearing the week before, but with cooler weather, we planned more clearing of summer growth on the Chapter's section heading south from McCormick Gap. At the entrance station, we ordered cool weather and hold the rain until 3 p.m. Michael Seth and Marian Styles carried fuel and clipped small branches that were starting to grow into the trail corridor, while John Shannon operated the string trimmer. After the first 10 yards, there was no heavy growth but trimming made the trail feel more open, and we hoped we slowed growth of poison ivy on the trail. We sent over a mile before turning around under still relatively cool conditions. A number of people thanked us for our work. After cleaning and returning the trimmer to its neat and clean toolbox, we headed home after 3 p.m. and encountered heavy rain and were glad we had requested that it be held until them. John was relieved that despite sending poison ivy flying with the string trimmer, he did not get a rash.